Q: How do I join FFA? A: FFA is an intracurricular student organization for students enrolled in agricultural education courses. To join, you must be in grades 7-12 in a school that offers ag courses. Once you graduate, you are eligible to maintain your active membership until November 30 following the fourth national convention after your graduation. A: Yes. In Louisiana, state dues are $5 per member, and national dues are $7 per member. Local chapters may also charge chapter dues. Q: How do I maintain active membership? A: 1. While in school, be enrolled in at least one agricultural education course during the school year and/or follow a planned course of study; either course must include a supervised agricultural experience program, the objective of which is preparation for an agricultural career. 2. Show an interest in the affairs of the organization by attending meetings, striving for degrees of membership and participating in other organized activities of the chapter. 3. Pay all current state and national dues by the date determined by the chapter. 4. 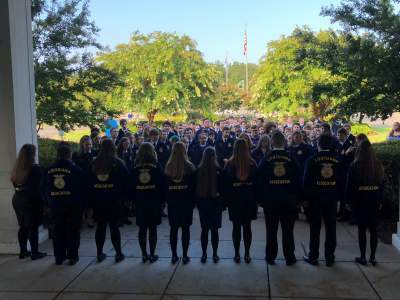 Display conduct consistent with the ideals and purposes of the National FFA Organization. Q: What is the National FFA membership affiliation program? A: Chapters that desire for 100% of their ag education students to be FFA members can become affiliated chapters. This allows the chapter to be billed for a lump sum once a year by National FFA based on their number of students. The more students your chapter has, the less your chapter will pay per member for national dues. Q: How does my chapter become affiliated? A: See the information in the side module regarding the chapter affiliation and click on "How to Affiliate." Q: Does my chapter affiliation also make me a Louisiana-affiliated chapter? A: YES! An affiliation propsal was approved by the Executive Committee on August 11, 2018. If you become an affilated chapter, you will now be state- and nationally-affiliated. Q: What are the benefits of affiliation? *NOTE: State dues for affiliated chapters will remain at $5 per member. You can help grow Louisiana FFA by increasing membership in our state. For only $12, you can help an ag education student join FFA. Contact us at association@laffa.org for more information!